A long time ago I was a young sailor. On a couple of occasions I recall seeing a Chief Petty Officer wearing his Dress Blues, and the hash marks (service stripes) on his sleeve ran from cuff to his elbow. One time I saw a Second Class Petty Officer in his dress blues who I joked crewed with Noah, by the years represented on his uniform. More often than not I would see “red” instead of the “gold”. For those who are unfamiliar with hash marks, or Navy uniforms, these once represented four-year periods of service (now they represent 3-years). After twelve years of “good conduct” – we earned a “Good Conduct” medal/ ribbon for each four-year period – we had the right to wear gold-threaded rating badges and hash marks on our service blues – either the “Cracker Jacks” for junior Sailors, or the Chief’s Dress Blues. The Chief pictured here, and in particular, the Master Chief (the rating badge with two stars, red stripes, and hash marks to his elbow) seems to be a shipmate of mine from the days of Sail. However, he screwed up somewhere. Probably chewing out a junior officer over one of the Sailors – or stupidity that the Officer committed. And he didn’t get punished badly. He just didn’t earn a “Good Conduct” ribbon somewhere in the previous twelve years! But you do not become a Master Chief Petty Officer by being a screw up. Or a “politician”. 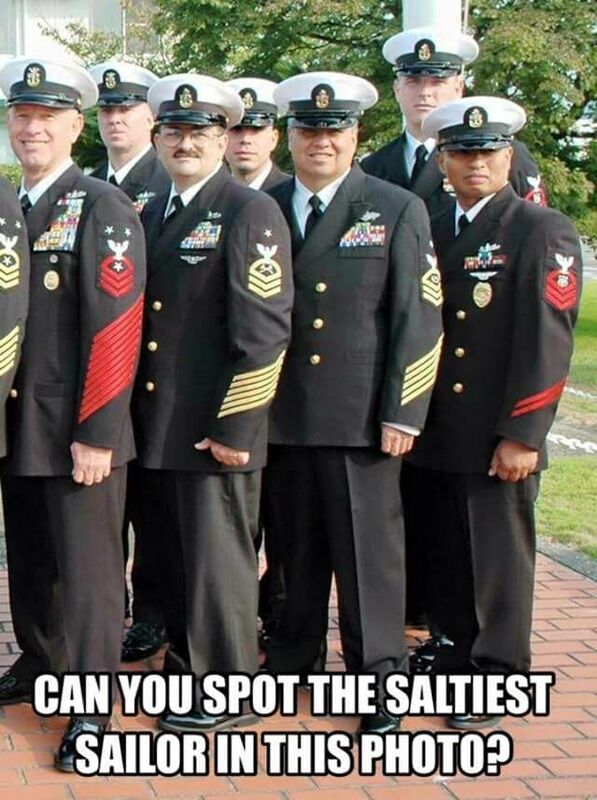 We could use a few more of these “Salty Sailors”, particularly in our universities and halls of Government. But then they would never earn gold hash marks. Too much stupidity. Too many opportunities to cuss out kids, professors and politicians for unprofessional conduct. If we only still used “fan room” counseling.